The first Women in Business Expo has been declared a great success, paving the way for an annual event. Around 400 people attended the event at Walsall FC’s Banks Stadium. The Women in Business Expo event was organised by Walsall-based Headz Up Business, which delivers business training, business networking events and conferences. In addition to a fashion show, award were handed out to inspirational individuals and businesses that have helped to support local women over the past twelve months. Funds were also raised for the educational charity, Women Acting in Today’s Society. The highlight of the Expo was the ‘Dress for Success’ fashion show which looked like a professional catwalk show and the sort of thing you’d expect to see at London fashion week! Image consultants gave tips to attendees about how to maximise their look and boost confidence. There were also lots of exhibition stands from local businesses and societies. Although most exhibitors used the shell schemes provided or simply brought along pop-up roller style banners, some organisations really went to town. If you’re thinking of exhibiting next year and need advice for your own exhibition stand, give us a call on 020 333 200 92! 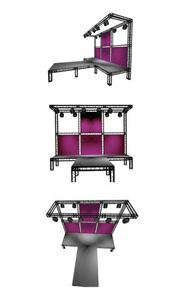 As a leading supplier of stage trussing, we were particularly interested in the catwalk solution. Our own TECHwire (X-25) solution is particularly suited to catwalk installations. Who knows, we may be even be involved next year!